Login or register below to request a refill. Please complete the refill request form below to submit your refill request online. Please see refill policy for pharmacy privacy terms and conditions. HALL FAMILY PHARMACY SHALL NOT HAVE ANY LIABILITY OR RESPONSIBILITY FOR ANY ERRORS OR OMISSIONS IN THE CONTENT OF THIS SITE. HALL FAMILY PHARMACY DOES NOT REPRESENT OR WARRANT THAT THE INFORMATION ON THIS SITE IS ACCURATE, COMPLETE, RELIABLE, USEFUL, TIMELY OR CURRENT OR THAT THE SITE WILL OPERATE WITHOUT INTERRUPTION OR ERROR. 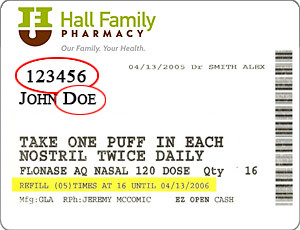 HALL FAMILY PHARMACY DOES NOT ENDORSE OR MAKE ANY REPRESENTATIONS OR WARRANTIES ABOUT THE OPTIONS OR OTHER SERVICE OR DATA YOU MAY ACCESS, SUBMIT, DOWNLOAD OR USE AS A RESULT OF THE USE OF THE INFORMATION CONTAINED ON THIS SITE, OR ABOUT ANY THIRD PARTY SITES YOU MAY LINK THROUGH THE SITE, WHICH LINKS ARE PROVIDED FOR CONVENIENCE ONLY. HALL FAMILY PHARMACY MAKES NO REPRESENTATION ABOUT THE SUITABILITY OF THE CONTENT OF THE MATERIALS ON THIS SITE FOR ANY PURPOSE AND SHALL HAVE NO RISK OR RESPONSIBILITY FOR YOUR USE OF ANY OF THE CONTENT. IN NO EVENT SHALL HALL FAMILY PHARMACY, ITS AFFILIATES OR ANY OF THEIR EMPLOYEES, DIRECTORS, OFFICERS, AGENTS, VENDORS OR SUPPLIERS BE LIABLE FOR ANY DIRECT, INDIRECT, PUNITIVE, INCIDENTAL, SPECIAL OR CONSEQUENTIAL DAMAGES ARISING OUT OF OR IN ANY WAY CONNECTED WITH THE USE OF THIS SITE, THE CONTENT OF THIS SITE, THE DELAY OR INABILITY TO USE THIS SITE OR OTHERWISE ARISING IN CONNECTION WITH THIS SITE, WHETHER IN CONTRACT, NEGLIGENCE OR OTHER TORTIOUS ACTION, EVEN IF AN AUTHORIZED REPRESENTATIVE OF HALL FAMILY PHARMACY HAS BEEN ADVISED OF OR SHOULD HAVE KNOWN OF THE POSSIBILITY OF SUCH DAMAGES. IN JURISDICTIONS WHICH DO NOT ALLOW THE EXCLUSION OR LIMITATION OF LIABILITY FOR INCIDENTAL OR CONSEQUENTIAL DAMAGES, SUCH LIMITATION SHALL NOT BE APPLICABLE TO YOU. YOUR USE OF THE SITE IS AT YOUR SOLE RISK AND IF YOU ARE DISSATISFIED WITH THE HALLFAMILYPHARMACY.COM SITE, ITS CONTENT OR WITH THESE TERMS AND CONDITIONS, YOUR SOLE AND EXCLUSIVE REMEDY IS TO DISCONTINUE USING THE SITE. By accessing and using this Prescription Refill Request you understand that the information used to request this refill has been certified secure and is within the rules and regulations of HIPPA, you agree that your access and use is subject to these terms and conditions as well as applicable laws, as governed and interpreted pursuant to the laws of the State of Tennessee and without regard to its conflicts of law provisions. Any disputes arising out or in connection with your use of this Site shall be exclusively venued in the Court/Legal system in the State of Tennessee. Our failure to insist upon strict performance of any provision of these terms and conditions shall not be construed as a waiver of any provision or right. All prescription refill request entered by the Patient to www.hallfamilypharmacy.com is verified within our prescription software on site to deem whether or not the patient has a valid prescription available for refill. By submitting a refill request on our site you are agreeing that the information provided is accurate to the best of your knowledge. If any part of this agreement is ruled to be unenforceable, then such part shall be limited or eliminated to the minimum extent necessary, with the remainder of agreement remaining in full force and effect. The terms and conditions constitute the entire agreement between us governing your use.